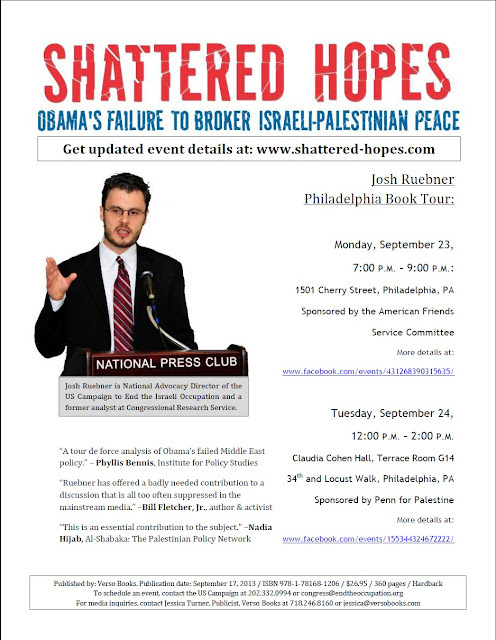 Earlier this month, Josh Ruebner, our National Advocacy Director, shared the exciting news of the publication of his first book, Shattered Hopes: Obama's Failure to Broker Israeli-Palestinian Peace. We hope that you can join him at one or more of the ten events he'll be doing in the greater Los Angeles area--Culver City, Los Angeles, Garden Grove, Irvine, Riverside and Pasadena--from Tuesday, October 8 - Monday, October 14. Check out this five-minute video preview of Josh's Shattered Hopes book tour. Below is a flyer for the events, all of which are free and open to the public. Click here for a larger version of the image below, or click here for a PDF version. RSVP and invite your friends on Facebook to the events at Culver City United Methodist Church, Loyola Marymount University, the Islamic Society of Orange County, Irvine United Congregational Church, All Saints Episcopal Church-Pasadena, and the University of Southern California. Also, find additional details on two events at All Saints Episcopal Church-Riverside. We are excited to announce that he will be coming to San Diego on Wednesday, October 9 as part of his book tour. He'll be at the First Church of the Brethren, 3850 Westgate Place, San Diego, CA 92015 for an event at 7:00 PM. Look for us in the Friends Meeting Room. Last week, I shared the exciting news of the publication of my first book Shattered Hopes: Obama's Failure to Broker Israeli-Palestinian Peace. I hope that you can join me at one or more of the five events I'll be doing in the Boston area from Sunday, September 29-Wednesday, October 2. Below is a flyer for the events, all of which are free and open to the public. Click here for a larger version of the image, or click here for a PDF version. Additional info about the event at First Parish Cambridge is here. And RSVP and invite your friends on Facebook to the events at First Parish Cambridge, Boston College, Harvard, Tufts, and at First Baptist Jamaica Plain. I'm excited to come to New Haven on Saturday, September 28 as part of my book tour. I'll be at the New Haven Public Library, 133 Elm St., New Haven, CT 06510 for an event sponsored by the Greater New Haven Peace Council at 1:30 PM. Look for us in the Performing Arts Space of the library. This event is free and open to the public. For more details, click here. Yesterday I shared the exciting news of the publication of my first book Shattered Hopes: Obama's Failure to Broker Israeli-Palestinian Peace. For those of you in the Washington, D.C. area, I'll be kicking off my book tour in D.C., Columbia, MD and Arlington, VA beginning Sunday, September 15-Friday, September 20. Below is a flyer (click on it or here for a larger version) with all the event details. Click here for a larger PDF version.